The Classic Large Cent series only lasted for five years and all are rare and valuable as they climb into the VG8 (Very Good) grades and up. You can still find a good deal on all dates in AG3 (About Good) and G4 (Good) grades. The 1810 is the highest mintage at 1,458,500 and you can find these coins in good grades for less than $50 and less than $40 in AG3. 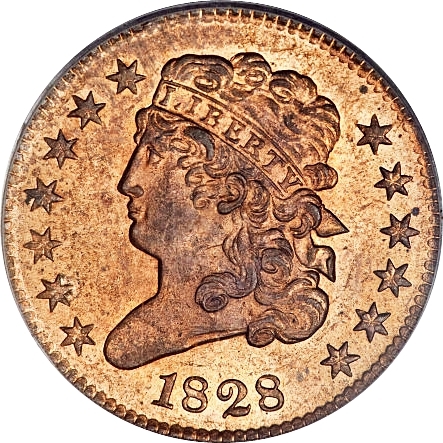 The most rare date is the 1809 with a mintage of 222,867 and a value of at least $195 in G4. You also have three conditional factors that determine the value of a Classic Head Large Cent and they are: Red (RD), RB (Red-Brown), BN (Brown). A RD coin is going to have at least 90% original luster as struck by the mint and is the most valuable condition. The luster conditions only apply to mint state coins so any circulated coin will be designated BN. VF (Very Fine) Classic Head Large Cents are worth over a thousand dollars and examples graded MS63 are worth $15,000 to $27,000 depending on the date and variety, but need to be certified by grading services like PCGS or NGC. There’s a few of varieties for this series, and too many to go into to detail about, so I will mention the most popular and a couple values. I encourage you to consult a book on the subject to learn more about the varieties and the values. 1811/0 is a well known over-date variety and the value begins at $195 in G4 but choice examples can bring more value, the 1812 Large Date is another and it’s G4 value is $100. 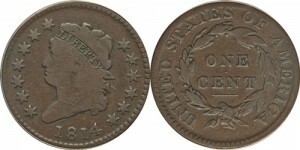 Classic Head Large Cent value is determined by the rarity of the date, grade, condition and if the date is a rare die variety. Worth of a Classic Large Cent.